With each passing day, history is made somewhere by someone so it’s often interesting to look back on what your beloved football team has done on this day in history in years gone by. Read on to find out what happened when the Swans played on May 11th in previous years. 1 year ago – Bafetimbi Gomis scored a dramatic late goal to secure the Swans a shock 1 nil victory at the Emirates Stadium over Arsenal. With Lukasz Fabianski in fine form at the other end, the win meant the Swans consolidated their 8th place position in the Premier League and stayed on course for a record Premier League points tally and highest placed finish. 2 years ago – Goals from Nathan Dyer, Marvin Emnes and Wilfried Bony gave the Swans a comfortable 3-1 victory at Sunderland to round off the 2012/13 Premier League season in style at the Stadium of Light. It was a great way for Garry Monk to celebrate after being name full-time Swans manager just a few days earlier. The victory meant the Swans finished in 12th place on 42 points. 10 years ago – The Swans were held to a 1-1 draw at the Liberty Stadium by Brentford in Coca-Cola League One Play-Off Semi-Final 1st leg. The 19,060 crowd endured a tense game with Sam Ricketts grabbing an 86th minute equaliser for Kenny Jackett’s men. A certain Darren Pratley impressed in the Bees midfield that evening. 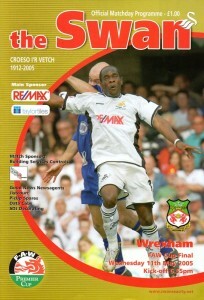 11 years ago – The Swans beat Wrexham 2-1 to win the FAW Premier Cup in the last ever game to be played at the club’s famous old Vetch Field ground. Over 9,340 fans came to say goodbye to the Vetch with a Pejic own-goal and Andy Robinson strike – the last ever goal at the Vetch Field – ensuring the Swans added more silverware to the cabinet having secured promotion just a few days earlier. 25 years ago – League leaders Cambridge United beat the Swans 2 nil at the Abbey Stadium in Barclays League Division Three, as Swans manager Frank Burrows handed a debut to right back Steve Jenkins. 31 years ago – A controversial 87th minute Derek Parlane penalty gave the Swans a 3-2 win over Bristol Rovers in Canon League Division Three. The Vetch Field crowd of 5,155 were treated to a thriller as Robin Turner and Colin Pascoe also netted for John Bond’s men as they earned a crucial 3 points in their quest to avoid relegation. 34 years ago – The Swans held bitter rivals Cardiff City to a goalless draw at Ninian Park in the Welsh Cup Final 1st Leg in front of a 11,960 crowd. 35 years ago – Fourth Division Hereford United held the Swans to a 1-1 draw in the 2nd leg of the Welsh Cup final in front of an Edgar Street crowd of 7,083. Robbie James scored for the Swans as they lifted the Welsh Cup on aggregate 2-1, meaning european football would return to the Vetch Field the following season for the first time since 1966. 37 years ago – Goals from John Toshack and Alan Waddle earned the Swans a 2-1 victory over Chesterfield in front of a packed Vetch Field crowd of 22,838 to secure promotion as Third Division Champions to the 2nd Division after a 14 year absence. 48 years ago – Former Swansea City striker John ‘The flying postman’ Williams was born in Birmingham. Williams enjoyed three different stints at the Swans, in 1991/92, on loan in 1995 and 2001-2003. A fan favourite due to his sheer speed, Williams scored 19 goals in 117 appearances throughout his Swans career.